We got back from Buenos Aires a few days ago and I was all set to post my Argentina eats until I went for lunch at two week old Mamasan in Seminyak and decided that this post had to go out before anything else. 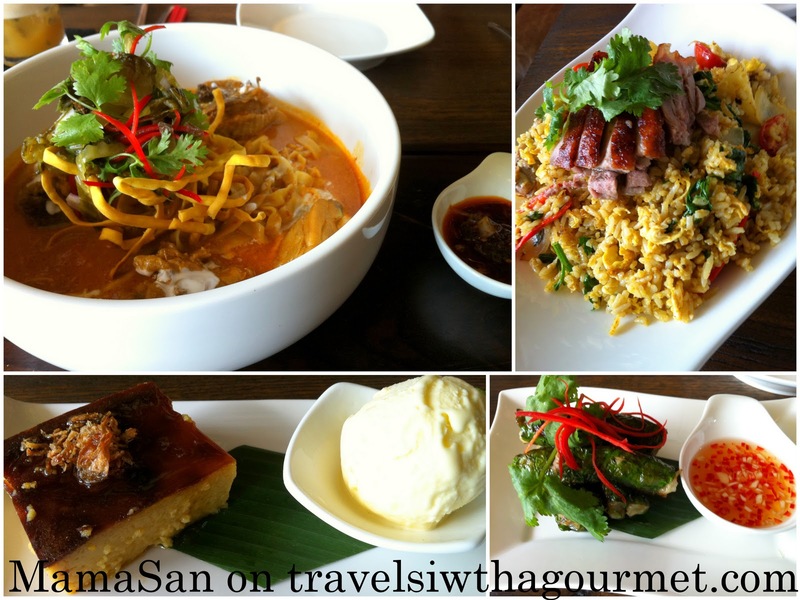 Mamasan is the new restaurant from the same owners of Sarong and specializes in noodles and wok-stir-fries with lots of designer drinks to go along with the spicy food. 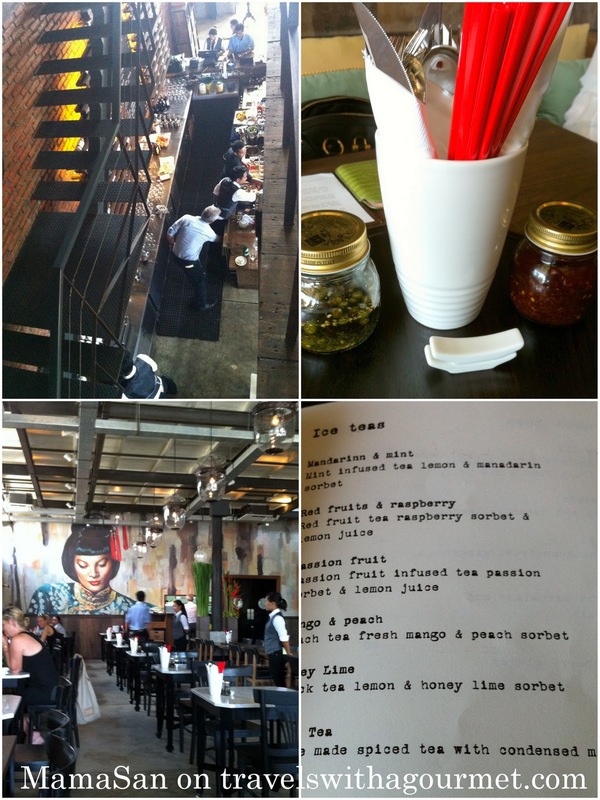 P and I went for lunch last Thursday and were pleasantly surprised by the modern funky interiors, the comprehensive southeast Asian menu and the cool bar on the second floor. There were several tables taken for lunch but not as packed as we hear dinner is (book ahead!) with two seatings in the evening and lots of people waiting at the upstairs bar for a table to free up. To start, we looked through the extensive bar menu – lots of cocktails and non alcoholic drinks and a decent wine list with most New World wines. I decided to try one of their frozen teas – the honey and lime which was black tea with honey and lime sorbet – refreshingly cold especially now in Bali’s scorching 30C days. P opted for the passion fruit juice, another frozen concoction of fresh juice and fruit sorbet. We shared a Vietnamese starter of minced pork wrapped in Betel leaves – delicious minced pork, like a spring roll without the crunch, with a sweet chili dip alongside. Next up were two main courses. 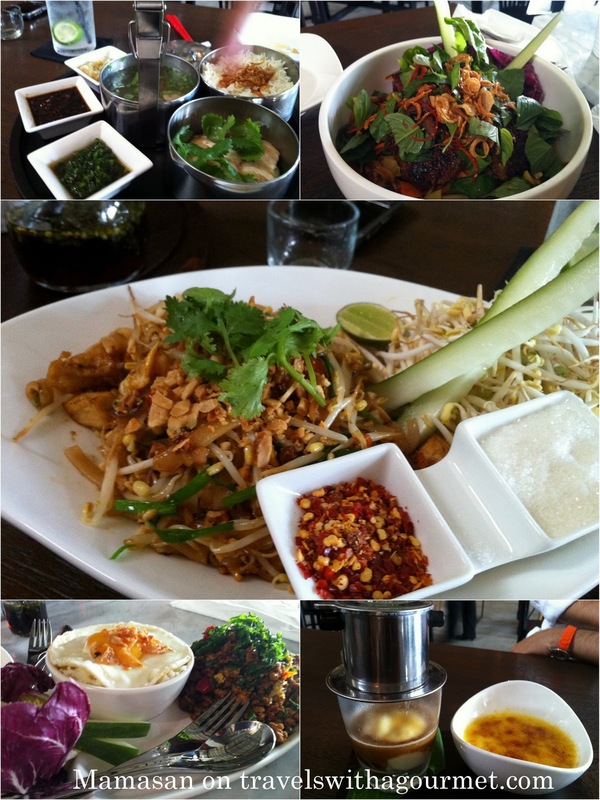 We decided to order two dishes to share, family style: one noodle – Khao Soi, the northern Thai dish of curried noodles with chicken and one wok stir-fry – the Peking duck fried rice. Portions are big so the dishes are meant to be shared. First came the curry noodles – flat fettuccine-like noodles in a rich curry flavored broth which was creamy and spicy at the same time. The Peking duck fried rice was served last and was a large plate of smoky-flavored fried rice with pineapple chunks, red chilies and onions and topped with several slices of roast duck. We managed to polish off most of the curry noodles but only ate half the fried rice as we were full by then and still wanted to leave space for dessert. We shared the mung bean cake – a sweet bean and rice cake dessert which, strangely, came with fried crispy garlic on top that we scraped off the palm sugar glaze. The cake came with a light coconut ice cream and worked well with the sweet bean cake. Illy coffees to end our large lunch and a promise to lunch again together soon. A few days after, I went back again for lunch, this time with the family as I was eager to show off my discovery to A. Again, the restaurant had several tables filled but wasn’t so full that reservations were needed. We settled into the corner banquette and had a longer look at the menu. We decided, as usual, to do family style and ordered several dishes to share. To start, we had the Thai prawn cakes – sticky sweet and spicy prawns shaped into a patty and fried then served with a sweet chili sauce – delicious! Then the table started to fill up with our orders: a triple-tier metal tiffin container was served for Hainanese chicken rice set lunch with some clear chicken soup in one container, rice cooked in the chicken broth in another and slices of steamed chicken in the third. Standard sauces of ginger, green onion and dark soy were served alongside. We also had prawn Pad Thai with a tiny plate of dried chili and sugar so you can make the noodles as sweet or as spicy as you like, a Vietnamese salad of thin strips of carrots and cucumber flavored with lemongrass, mint, Thai basil and crunchy shallots in a fish sauce, lime and sugar dressing with several fired pork patties thrown in the mix. We started on these two main courses before the next two were served: fiery Thai minced chicken, garlic, chili and basil with steamed Jasmine rice topped by a fried egg and the same Peking duck fried rice which P and I shared a few days ago. As much as we tried, we only managed to finish the salad, the noodles and the chicken rice and had some leftover fried rice and Thai minced chicken to take home. To soothe our burning palates, we shared the creme brulee – a crunchy-sugar-topped vanilla bean custard served with a Vietnamese coffee affogato (usually vanilla ice cream in which a shot of espresso has been added, this version has the vanilla ice cream in a glass topped with a Vietnamese coffee maker so the the hot and milky Vietnamese coffee drip-brews onto the ice cream). Less than a month open and after two yummy lunches, this is now my new Bali favorite for the delicious dishes, the casual yet cosmopolitan interiors, the creative drinks menu and the courteous service. Did I also mention that it’s fully air-conditioned and that they have valet parking? What more can one ask for? It’s going to get very crowded soon so book your dinner table now or pop in for lunch when it’s less busy. I bet it’s going to be the favorite of many Bali residents too so don’t say I didn’t warn you. *Kitchen open for lunch till 3:00 and dinner till late. Drinks served in-between lunch and dinner hours.